The Garlic Scape is the "flower stalk" of the Hard Neck Garlic. This wonderful curled green . . . is not only beautiful to look at but but has amazing flavor with a nutritional punch. 1. Scape Pesto . . .
part mellowing and two parts deprivation. Another great way to showcase scapes is to grill them, tossed with a little olive oil, salt, and pepper, over direct heat for about two minutes. Flip them once, halfway through, and finish with an extra sprinkle of flaky salt and maybe a bit of lemon juice and zest. Scapes also work well as a vegetable, cut into lengths and added to stir-fries or blanched and added to salads, much as you might use green beans. They are wonderful in potato salad, macaroni salad or other summer favorites in the place of green onion or onions. coordination is tough to argue. Scapes would make a lovely compound butter with a little lemon and maybe some fresh thyme. You could use the butter to make a tarted-up garlic bread, and most anything that could be tossed on the grill can finished with a nice slice of this melting goodness. To take a more utilitarian approach, you can slice scapes to whatever length you like and use them as you would garlic, as an aromatic in a wide variety of recipes. Scapes lose a lot of their bite when sautéed, more so than garlic cloves, so use at least three or four times as much scape-age as you would clove-age. Add the stock to the browned mushrooms, bring to a boil and lower the heat so the sauce is at a lively simmer. Cook until the liquid is reduced by about half, about 5 minutes. If the skillet is large enough to accommodate the sauce and pasta, drain and drop it directly into sauce in the skillet. If not, drain the pasta, return it to the pot and pour in the sauce. Toss in the parsley; bring the sauce and pasta to a boil, stirring gently to coat the pasta with sauce. Check the seasoning, adding salt and pepper if necessary. Remove the pot from the heat, stir in the cheese and serve immediately in warm bowls. Try this hearty chicken stir-fry that's served with rice - ready in 30 minutes. In 12-inch nonstick skillet, heat oil over medium-high heat. Add chicken, garlic and gingerroot; cook and stir 3 to 4 minutes or until chicken is light golden brown. Add carrots, 1/4 cup of the broth, the soy sauce and pepper flakes. Cover; cook over medium heat 3 minutes, stirring once. Add frozen sugar snap peas and bell pepper. Cover; cook 4 to 6 minutes, stirring once, until vegetables are crisp-tender. In small bowl, mix remaining broth and cornstarch; stir into chicken mixture. Cook 1 minute, stirring frequently, until sauce is bubbly and thickened. Serve with rice. 2. Peel away the outer layers of the garlic bulb skin, leaving the skins of the individual cloves intact. Using a knife, cut off 1/4 to a 1/2 inch of the top of cloves, exposing the individual cloves of garlic. 3. Place the garlic heads in a baking pan; muffin pans work well for this purpose. Drizzle a couple teaspoons of olive oil over each head, using your fingers to make sure the garlic head is well coated. Cover with aluminum foil. Bake at 400°F for 30-35 minutes, or until the cloves feel soft when pressed. 4. Allow the garlic to cool enough so you can touch it without burning yourself. Use a small small knife cut the skin slightly around each clove. Use a cocktail fork or your fingers to pull or squeeze the roasted garlic cloves out of their skins. 10 garlic cloves, peeled and sliced. 5 cups of beef broth. 1 cup of dry sherry. French bread, sliced and toasted. Sauté the garlic in the olive oil until it turns golden. Heat the beef broth with sherry. When the broth reaches the boiling point, add garlic and the olive oil. Season with salt and pepper to taste; then simmer for about 30 minutes. Strain out the garlic and reheat. Sprinkle toasted French bread slices generously with Parmesan cheese, then place them in a 425°F (220°C) oven for about 3-4 minutes. Put the hot toast in the bottom of soup dishes; then pour the soup over top. 1. Combine 1 1/2 cup evaporated milk and garlic cloves in a pan, heat and simmer until garlic is soft (about 15-20 minutes). Milk will reduce a little. 2. In a blender, puree milk and garlic mixture with cream cheese until smooth. 3. Return mixture to pan and add 1/2 cup nonfat milk and cornstarch. Heat to simmer. Sauce will thicken slightly. Add 1/4 cup Parmesan cheese. 4. Bring a large pot of lightly salted water to a boil. Add pasta and cook for 8 to 10 minutes or until al dente; drain. Toss sauce with cooked pasta. Season with salt and pepper and serve with parsley sprinkled on top. Serve remaining Parmesan cheese separately. 2 teaspoons of garlic, minced. 1 teaspoons of lemon pepper. 1. Melt the 2 tablespoons of butter in a suitably-sized skillet over medium-high heat. 2. Stir in the 2 teaspoons of minced garlic. 3. 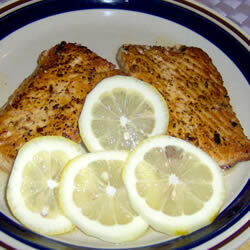 Season the fillets of salmon on both sides with the lemon pepper. 4. Place the fillets in a pan and cook until it flakes when tested with a fork. Make certain to flip the fillets midway through cooking to brown on each side. 5. Sprinkle with lemon juice.